Yes, a recipe for making chocolate; not chocolate cake, chocolate truffles, cookies or ice cream but the crisp, dark, stuff that you use to make those things with (although this chocolate is so good that you’ll want to eat it on it’s own). I had no idea how incredibly quick and easy it was to make chocolate from scratch using organic cocoa butter, cacao powder, sugar and vanilla – until a friend shared the secret. You’ll need to buy the ingredients from Amazon but it’s totally worth it as you can add whatever you like to the melted chocolate before it sets; crispy bacon, sea salt, chili, toasted nuts, dried fruits, praline – you name it. So go ahead, make chocolate! This has to be the ultimate gluten and dairy-free treat and you’ll never want to buy ready-made chocolate again. If you want to use sea salt, bacon bits, chili powder, cardamom, crystallized ginger, candied citrus zest, lavender flowers or any other exotic ingredient, add those a bit at a time tasting as you go. 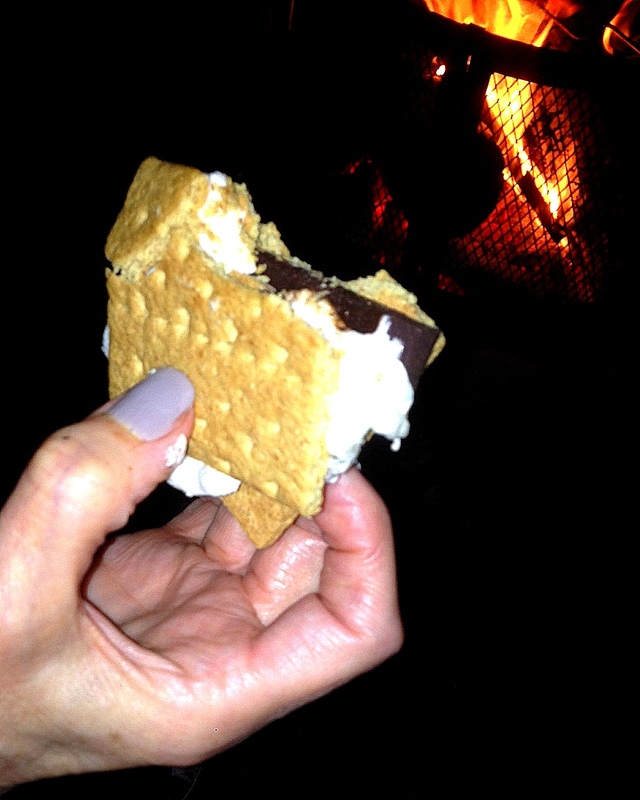 Another note: this chocolate elevates that campfire treat ‘S’mores’ to another level of yummy-ness! Chop the cocoa butter into small chunks, put them in a heavy pan without a lid and set over a very, very low heat to melt (it doesn’t take long – keep an eye on it and under no circumstances allow it to boil). Meanwhile, sift together the powdered sugar and cacao powder. Once the cocoa butter has melted, add the vanilla and swirl it around to disperse. Pour the melted cocoa butter and vanilla over the dry ingredients and stir well for a couple of minutes until the mixture is smooth. Stir in the remaining optional ingredients. Pour the melted chocolate mixture into a 9 x 13inch (23 x 33cm) baking pan and put it in the fridge for 15 minutes. After about 15 minutes, take it out and lightly score the surface with a knife so that you can break it up easily once the chocolate has hardened. Put it back in the fridge for about 1 hour to completely set, or freeze it for 20 minutes if you’re in a hurry. Once set, the chocolate will shrink slightly from the sides of the pan making it easy to invert onto a flat surface to break it up into pieces. You can freeze the chocolate squares in freezer bags or just store in an airtight container in the fridge but bring them to room temperature before eating. This will make approx 1.5 – 2 cups of praline. It freezes really well and can be used straight from the freezer; sprinkle it over ice cream, beat into whipped cream, use as a topping for cheesecakes, etc. In a heavy pan without a lid, combine equal quantities (1 cup) of whole raw hazelnuts or almonds and (1 cup) of white sugar. Place the pan over a very low heat until the sugar melts – this can take up to 45 minutes. Eventually the sugar will become a deep golden color and runny. When it reaches the runny stage, stir everything with a fork to ensure there are no remaining sugar crystals then quickly pour the entire contents onto a large greased cookie sheet and allow it to cool and harden – this only takes a few minutes. Once it’s set, break it into smaller pieces then grind them in a coffee or spice grinder until you have the required level of fineness. Freeze in a rigid sealed container…you can easily spoon it out as needed. This entry was posted in Cookies & Edible Gifts, Desserts, Gluten Free Desserts. Bookmark the permalink.